Besides being blessed with scenic white sand beaches and crystal blue waters, the Philippines is also privileged to have majestic underwater creatures such as whale sharks. Locally known as butanding, these friendly giants grace the oceans of the Philippines generally from December to May. Swim with the largest fish in the sea specifically in some locations. #1 - Honda Bay, Palawan: There is actually more to Palawan than its beautiful beaches, rivers, and cliffs; Whale sharks also swim its waters! Schedule an encounter with these giants in Honda Bay where dive shops actually scout for whale sharks or in Tubbataha Reefs Natural Park, a UNESCO World Heritage Site, for an extravagant yet worthwhile dive with whale sharks. #2 - Sogod Bay, Southern Leyte: Chase after whale sharks in the oceans of Sogod, Leyte, a diving spot not yet so popular for swimming with whale sharks. It is actually a good thing because there's a higher chance for an exclusive one-on-one with the whale sharks in an uncrowded spot which in turn is safer for them as well. Whale sharks naturally migrate here from November to May. #3 - Donsol, Bicol: Maintained through guidelines and regulations, swimming with whale sharks in Donsol almost feels like a natural occurrence. Diving is prohibited but snorkeling is allowed and a trained guide or spotter always accompany the tours. 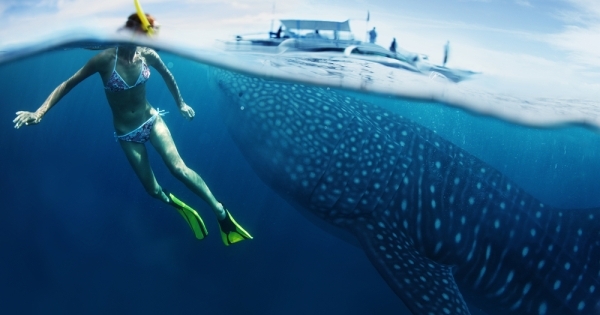 For a guaranteed whale shark encounter, visit Donsol from February to April. #4 - Oslob, Cebu: A town made famous by numerous whale shark encounters, there is no peak season for whale sharks in Oslob because they are there all year round. Sadly though, it is believed that it has disrupted their natural migration habits and life cycle. Above all, although whale sharks are believed to be gentle and friendly, they should not be touched for our safety and the whale sharks' as well.